Before it was an iconic New York City neighborhood, the Upper West Side was a bucolic stretch of land dotted with genteel country estates, modest wood frame homes, taverns, and goats. For generations it remained a quiet, rustic scene. 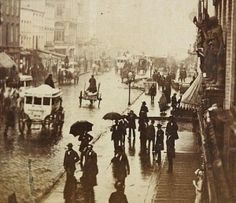 Then, in a frenzy of development in the 1880s, Queen Anne and Romanesque “brownstones” blossomed along side streets, while Beaux Arts apartment hotels, French flats, and transient hotels appeared along Broadway and Central Park West. On this walking tour, guide Rob Amell brings to life the old farms and dark roads of a bygone era. We seek out the orphan buildings, and occasional whole-block enclaves, that remain– time capsules of a lost 1880s world. We’ll hear about the mavericks and mischief-makers of the day, and attempt to coax a few gargoyles into sharing their secrets. Join us as we conjure shadows from the dusks of time and walk the streets of the lost villages of the Upper West Side. Rob Amell is a New York City historian, tour guide, and author of the blog Manhattan Unlocked. Rob has been decoding the streets of Manhattan for tourists and residents for 20 years. He is currently researching a book exploring the growth of upper New York City, due out in 2017. Note: The starting point for the walking tour will be provided when tickets are purchased.